Confession: I hadn't even heard of cornstarch pudding until a few weeks ago. And now I'm obsessed with it. It's easy and versatile, adaptable to dietary needs and whims: Make it with cream, whole milk, or skim milk, or dairy-free substitutes including soy and rice milk. You don't need much sugar, and butter and eggs are strictly optional. Where has this been all my life?! I have my friend Heather to thank. She pointed me to an online recipe from The Joy of Cooking (I may be the only food blogger in the world who doesn't have that cookbook), and mentioned she likes to prepare it with chai mix. 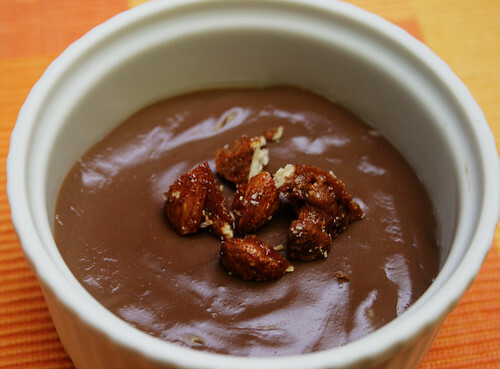 I couldn't decide if I wanted to make chocolate or chai pudding, so I tinkered with both. My kids don't like the chai infusion, so it's more of a treat for me. And I'm OK with that: From the run-up to Halloween through the end of the year, much of our family life seems to revolve around kid-oriented seasonal delights, edible and otherwise, and so I savored this simple pudding for myself. 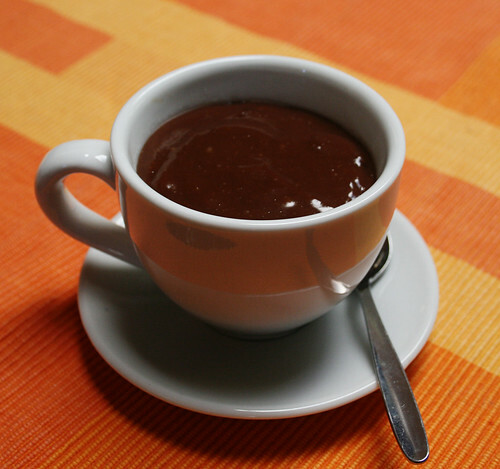 They'll get their vanilla and chocolate versions for now, but someday I suspect a warm dish of subtly spiced chocolate pudding will taste like home. If a child hasn't sneakily devoured all the sweets in your baking pantry, as seems to have happened in my house, you could swap semisweet or dark chocolate for the cocoa powder (be sure to cut back the sugar a bit to compensate). Anna suggested the perfect topping: the Best Spiced Nuts. These also would be delicious with a dollop of whipped cream or a sprinkling of chopped toffee. Use whatever kind of milk you like. (Soy goes especially well with chai and yields the rich-looking pudding pictured at the top, but dairy versions are creamier.) You may want to adjust the amount of sugar to suit your taste. If you're feeling really indulgent, stir in a bit of softened butter at the end. This makes 6 servings — dish them out in tea cups for maximum cuteness. In a saucepan, warm 2 1/2 cups milk over medium heat until steaming. Remove from heat, add tea bags, cover, and let steep for 5 minutes. Remove tea bags. Add sugar, salt, and cocoa to chai milk and reheat over medium heat. In a small bowl, stir together cornstarch and remaining 1/2 cup milk until smooth. When the chai milk mixture begins to steam, stir in cornstarch mixture. Continue stirring about 5 to 7 minutes until mixture just comes to a boil. Reduce heat to low and continue to stir until pudding is thickened, about 5 minutes. Spoon pudding into serving dishes. 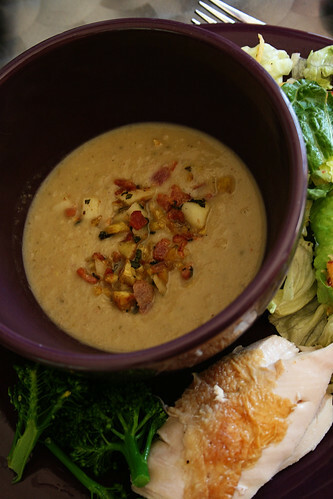 Serve warm or chill for up to a day. Have you ever thought about rice? It's present in almost every cuisine of the world, and is the main ingredient for many delicious meals. That's why it was chosen to represent the sense of unity of most cultures at my kid's school cooking club's classes. So the first dish to be prepared at the Cooking Club this year was a colorful dish from Korea, Bi Bim Bop. I first fell in love with this idea when I saw a kid's book in my local library, called Bee-Bim Bop!, by Linda Sue Park, illustrated by Ho Baek Lee, few years ago. Later I had the chance of trying some of the original plate in a Korean bowl place in Palo Alto. The book is amazing — so cute and so full of rhymes that it turns the task of preparing the dish into almost a musical experience. After four rounds of making the dish with kids at school, I finally got to invite our playgroup to make it, this time using beef instead of tofu. 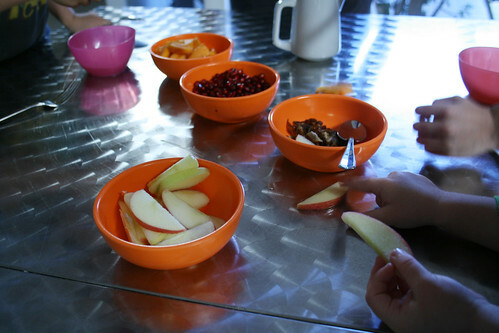 The key element to get the school kids and our playgroup involved was reading the book before cooking, and getting them used to the idea of "chop chop chop," as in the book, with a safe (plastic) knife. Then, the process used with the school kids: While kids at one table were prepping the vegetables, kids at another table were cutting tofu and preparing the marinade. The third table's kids were working with the eggs for the egg pancakes. The final result was amazing and put together the work of every kid: after watching us cook the veggies and tofu on the griddle, they all had a colorful bowl full of rice to be mixed. For many kids it was the first time to try some different vegetables, tofu, and soy sauce. And some of them were just following what the book suggested — mix mix mix — and eat! Any rice will do a great job here. If choosing beef, put the fresh steak in the freezer for about 15 minutes to help with the slicing. This recipe is adapted from Linda Sue Park's and also has some inspiration from recipes around the Web. If you are really daring to try something else, you can add a recipe of kimchi (as in this good recipe here). Preheat electric griddle to 370F. 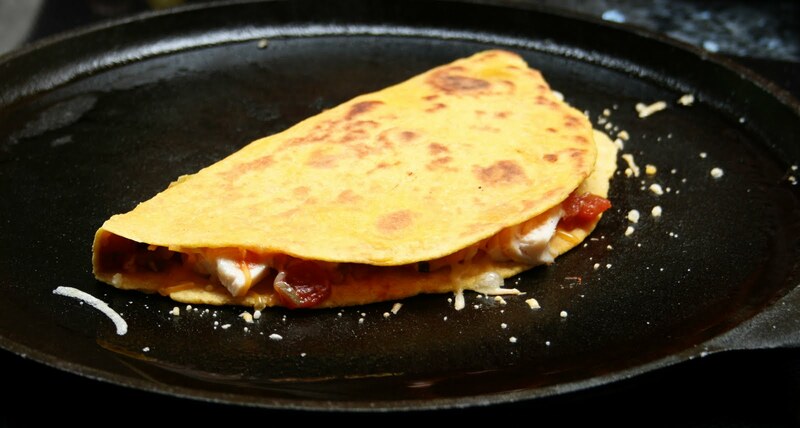 (You also can use a large skillet, over medium-high heat.) Chop the vegetables and set aside, each in a different bowl. Mix ingredients for the marinade in another bowl. Add the tofu or beef to the marinade. Beat the eggs lightly and prepare mini-egg pancakes in the griddle. When done, set them aside on a plate to cool down. 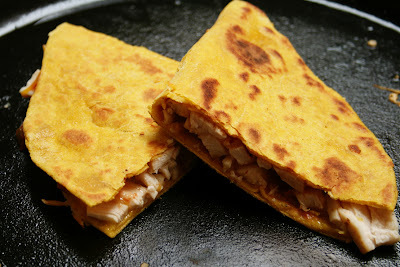 Add carrots and tofu (or beef) to the griddle and keep an eye on them, turning periodically. Cut egg pancakes into half-inch strips and set aside on a plate. Now add mushrooms, bean sprouts, and spinach to the griddle, keeping them separated. At the last minute add cucumber. When the carrots are cooked but still al dente, start removing vegetables, transferring each type to its own bowl. Removed the beef or tofu from the griddle. Serve all ingredients over a bowl of rice, to be mixed by the person being served. We're snacking happily on these simple fruit crisps, dried in the oven until crunchy. 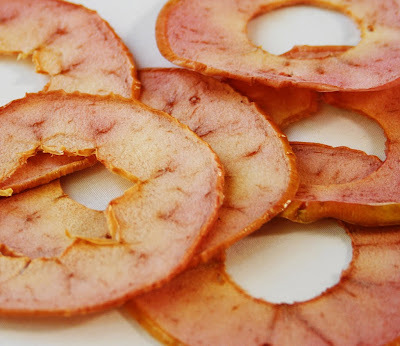 I've seen a lot of versions that add sugar, honey, or maple syrup, but really there's no need to add sweetening: These apple and pear crisps are delicious on their own, and a sprinkling of spices or vanilla bean makes them an irresistible treat. Isn't that sunset blush color gorgeous? These are Pink Pearl apples, a beautiful tart variety. My favorite stop at the market these days is a stand overflowing with countless varieties of apples and pears. The farmer is generous with samples, and the kids love to taste-test — we usually leave with at least a half-dozen varieties. Use organic fruit, if possible. I get three to four baking pans' worth of crisps from 1 1/2 pounds of fruit. Wash, core, and slice fruit 1/8-inch thick (a mandoline makes quick work of this). Fill a bowl with water, add lemon juice, and soak fruit slices for 10 minutes. Prepare baking pans with silicon mats or parchment paper. Drain slices and lay out in a single layer on prepared pans. Sprinkle with your favorite spices. Bake at 225 degrees for 2 to 3 1/2 hours until dry. Watch carefully after the first two hours to avoid browning. They should be fairly dry to the touch but still a little pliable when done — they'll become crisp within a few minutes after removing them from the oven. 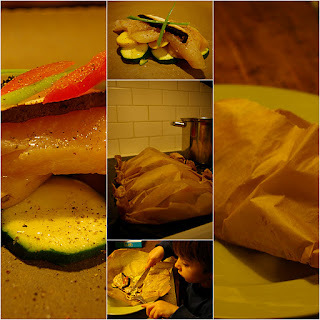 (If they don't crisp quickly, return them to the oven for a few more minutes.) Once cool, store in an air-tight container. Variation: For vanilla crisps, drain fruit and return to bowl. Split and scrape a vanilla bean over the slices and very gently mix in before baking. The sight of those beautiful acorn and carnival squashes inspired me to think about something beyond sugar and cinnamon treats. It made me think about something good to be served not just for a Halloween dinner, but also good for Thanksgiving menu. And then everything came to make sense: a Native North American classic inside a deliciously edible seasonal container. One of my kids was not happy when he saw the "dead" acorn squash, halved and cooked, in front of him — it used to be one of his favorite good-looking squashes in his "pumpkin patch" on the rug. But soon he was convinced that the squash's fate was good, and ate all of his succotash. As you might know, succotash can be interpreted in many ways as long as corn and white beans are included to the recipe. I mainly played with seasonings to enhance the sweetness of the corn and squash while adding a bit of a European flavor with thyme and shallots. Bake the squash while preparing the beans. It's a good idea to bake a whole batch of squash and sugar pumpkin to use in other recipes and freeze for later. Bake squash halves, face-down in a baking pan with a half-inch of water, at 375 F for about one hour. You want them firm, so check after 45 minutes to see if they're ready — avoid overcooking. 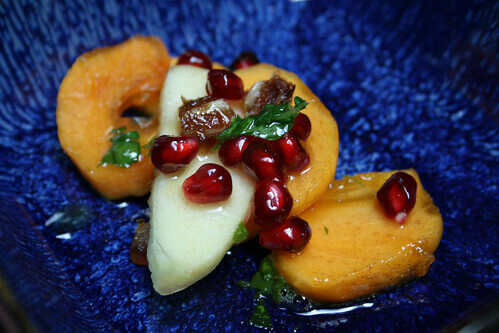 While squashes are in the oven, prepare the filling. Shallow-fry shallots and garlic in olive oil over medium heat. Add thyme and tomato sauce and simmer for 10 minutes. Then add beans and sugar pumpkin and stir. Add salt to taste, and simmer for about 20 minutes. Serve beans inside the baked squash. Happy eating! 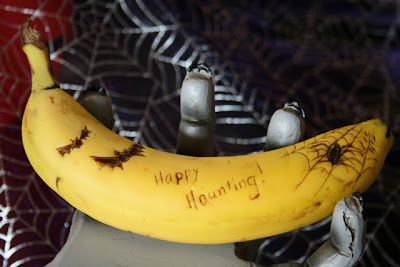 Have you tried magic writing on bananas yet? This is a perfect time to try it. 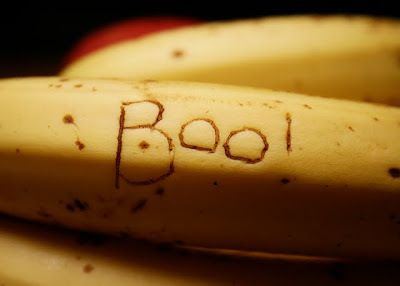 Using a toothpick, gently write your message on the banana peel. Within an hour, the letters will grow dark and clear. To "color in" a drawing, use a blunt toothpick or another dull tool to press on the peel, without breaking the surface. It's a great surprise for the fruit bowl or the lunchbox — kids love it! 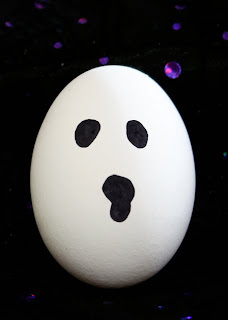 I made these eyes with washable markers, so I could rinse away the ink before cracking them open, and used a bolder Sharpie for the ghost. Decorate a hard-cooked egg and tuck it into a lunchbox — or leave a surprise in the egg carton for the next person to make an omelet. Boo! 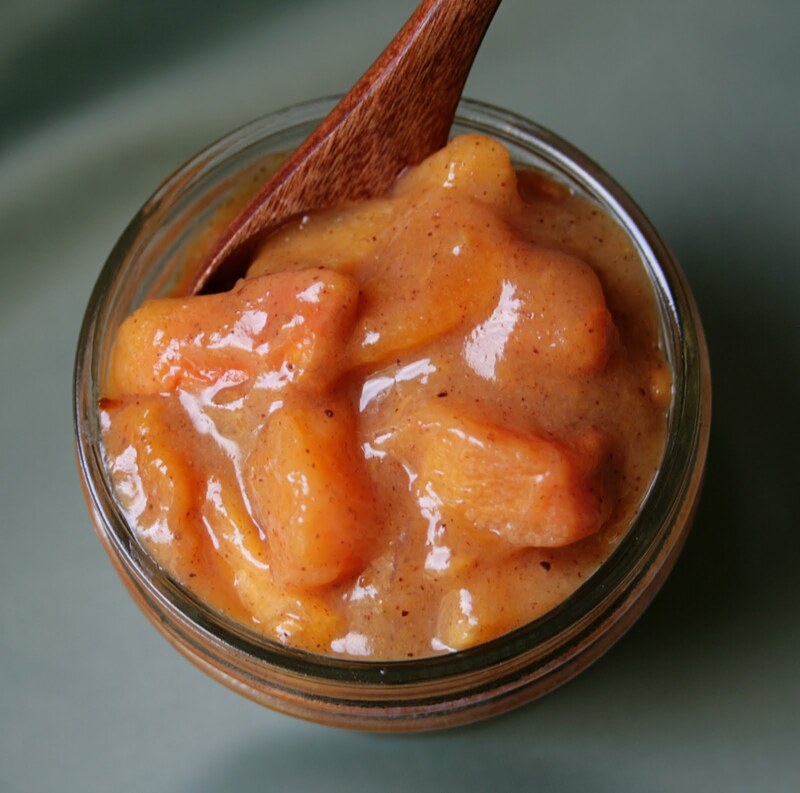 Pumpkin and coconut are considered a classic combination for traditional preserves and compotes in Brazil. Halloween time here sends me me back to those memories of sweetness — pumpkins are everywhere. My kids, for instance, are organizing their own pumpkin patch on a rug in the living room, made with the pumpkins they bring home from field trips... and although we don't celebrate Halloween there as we do here, the thought of candy associated with pumpkins just helped me to rescue that taste. But before I started to transform the small jack-O-lanterns-to-be in the house into an exotic compote (that just my grandma was able to prepare), I spent my time trying to find a way to blend the coconut reference into a classic recipe. The result was a hearty and perfumed baked goodie, ideal to be accompanied by Darienne's Whipped Pumpkin Cream Cheese. This recipe is freely adapted from King Arthur's Flour Harvest Pumpkin Scone. The original recipe shares a smart tip: Freezing the dough for 30 minutes before baking will make that delicious crunchy upper crust happen. 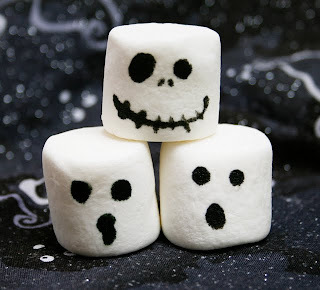 If you want to make them more Hallowee-ney, decorate them with Darienne's royal icing eyes, or drizzle with sugar icing. Mix all dry ingredients in a big bowl. 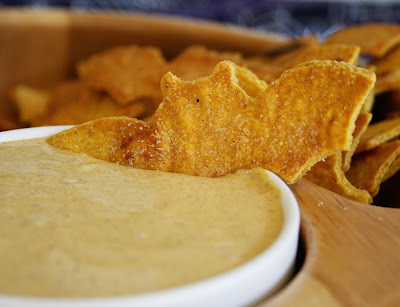 In another bowl, whisk eggs (or flax substitute) and mix with pumpkin. Cut butter or canola oil spread in the flour mix to make a coarse mix. 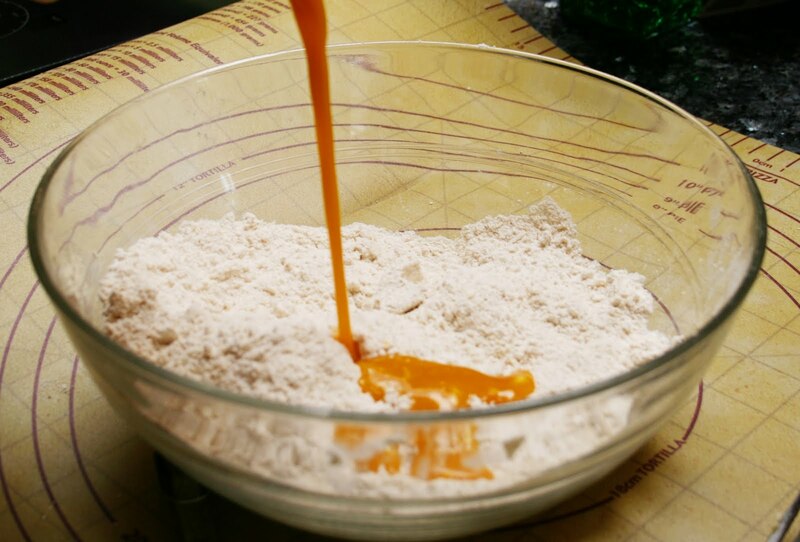 Add pumpkin mix gradually to the mixed flour and butter with the help of a wooden spoon. Knead a little bit, if necessary, to hold the dough together. Pat dough into two pie-shaped discs and transfer them to a cookie sheet covered with parchment paper. Cut them into 8 slices each and brush them with milk or milk substitute. Preheat oven to 425F. Put the pies in the freezer, uncovered, for ideally half an hour. Sprinkle wedges with sugar and cinnamon and bake for about 25 minutes or until scones are golden brown, making sure that all is baked to perfection. Remove from the oven and serve while still warm. We're addicted to Trader Joe's Pumpkin Cream Cheese. My older son tried it late in the season last year and turned to me, eyes huge: "I. Love. This!" It recently returned to store shelves for a second year, and now my younger son — the one who doesn't like cream cheese — is loving it too. We're happy it's back, but what will we do when it disappears from the stores again? The answer, of course: Make our own. If you have a TJ's near you, definitely seek out this spread. But if you don't, or if you want a version with less fat or less sugar, or it's April and you're craving pumpkin cream cheese, whip this up. I'm comfortable with the amount of sugar here, but you probably can reduce it by another tablespoon or two. It's delicious on bagels, but don't stop there — this spread is wonderful on celery ribs, quick breads, scones, and fresh warm bread, and as a dip with apple and pear slices or cookies. If you wish, substitute regular cream cheese or whole milk for the lower-fat equivalents and use prepared pumpkin pie spice instead of the individual spices. This doesn't have the shelf life of a store-bought blend — if you don't plan to use it up within a couple days, make a smaller batch. Combine cream cheese through spices in a mixing bowl. Using a stand mixer with a whisk attachment, blend for a few minutes until light. Gradually add milk, if desired, and continue to beat until light and fluffy. You're not going for the texture of whipped cream, just lightening up the cream cheese. 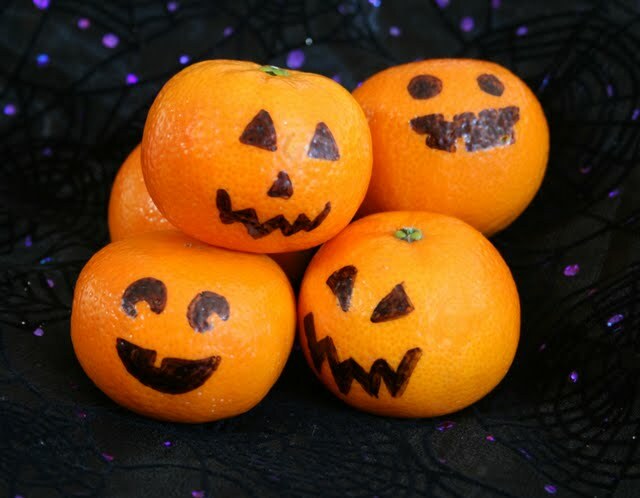 Like the clementine jack o'lanterns featured last week, these don't require a recipe — you just need marshmallows and an edible marker (such as Food Writer pens from Wilton). Draw a spooky face (I made ghosts and attempted Jack Skellington) and tuck them in lunchboxes. You also could insert lollipop sticks and arrange them in a jar or vase — or in cakes — for a Halloween centerpiece. It's a great little project for kids, too! Turn a clementine into a jack o'lantern by drawing a face on the peel with a Sharpie. This time of year, our fruit bowl is piled high with these guys, who find their way into daily lunch boxes. We're bringing a few dozen to our preschool party too. Super easy, and super fun! They're creepy and they're kooky, mysterious and spooky, they're all together ooky, they're royal icing eyes! My 7-year-old has a stack of Halloween-inspired food books he pores over this time of year. I'm smitten with the candy eyes, but I've never spotted them in a store. Really, they're just like the Candy Buttons I loved when I was little ... and those are just like royal icing. Which is used to make candy eyes. Make a stash of these candy eyes and you can add a bit of silliness — or ghostliness — to just about anything. Less than a half-hour's work yields a generous supply of long-lasting candies. They're perfect for decorating cookies, and they can add fun to to all sorts of food. 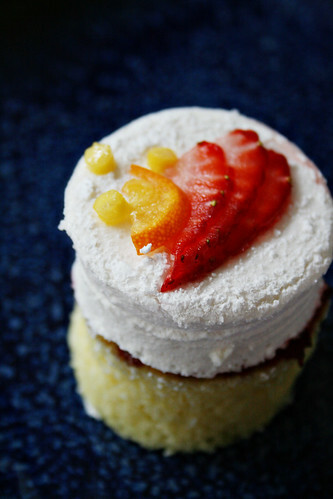 Some royal icing recipes use egg whites. Don't risk salmonella: Use meringue powder instead. (Look for it in the baking aisle at the market or craft stores.) I stuck with simple black-and-white eyes, but by all means, tint them any color you want. You can use royal icing to pipe ghosts, bats, monster faces, fangs, pumpkins — whatever you can think of. If you want to flavor it, add a bit of clear extract along with the corn syrup. For color, use gel coloring. Combine the meringue powder and water in the work bowl of a stand mixer. Using the paddle attachment, beat on high speed until foamy. Add the powdered sugar mix on low speed until combined. Add the corn syrup and beat on medium to medium-high speed for 5 to 7 minutes, just until the mixture is glossy and holds stiff peaks. Store in an airtight container in the refrigerator for up to five days. If you chill the frosting, you may need to let it sit on the counter for 30-45 minutes before using it. When the candies are thoroughly dry, store them in an airtight container. (I hear they can be stored for years, but I can't speak from experience.) I keep mine right on the waxed paper. 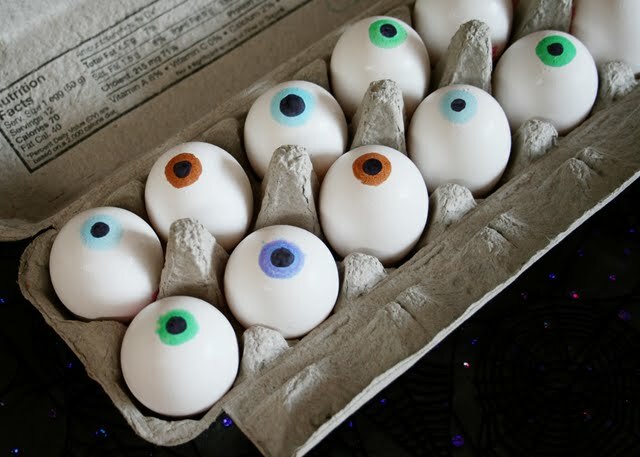 To affix the eyes, use a dot of icing or honey to make 'em stick. Keep a damp cloth or plastic wrap over any open containers so the icing doesn't dry out. If you're using a piping bag, wad up a damp paper towel or wash cloth and put it in the bottom of a glass; when you're not using the bag, stash it in the glass with the tip nestled in the damp towel so it won't dry out. To create larger shapes, pipe the outline with stiff icing, then "flood" the interior with slightly thinned icing. Make your own sprinkles: Pipe icing in long lines on waxed paper, let dry, then break it up to form sprinkles. You can make sprinkles in the exact color you want! Not all Halloween treats need to involve chocolate, caramel, and candy corn. These Monster Treats are a fun way to get your vegetables. 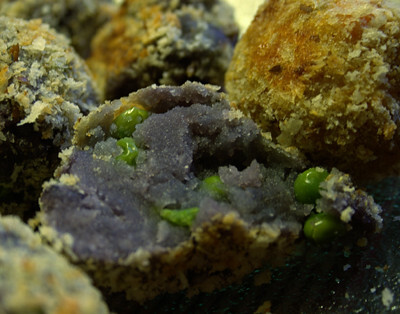 Covered in a crisp bread crumb coating, they break open to reveal brilliant purple potatoes and bright green peas. Monster guts? Monster boogers? Call 'em what you like. We call them deliciously fun. 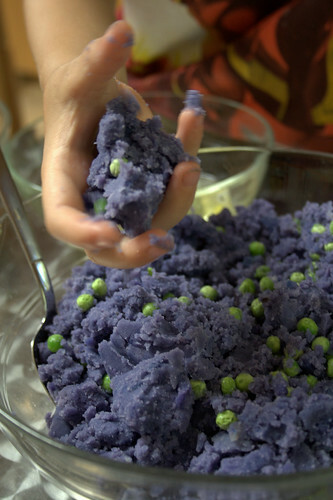 We liked the combination of bright green peas with deep purple potatoes, but you can mix in almost anything you like. You can use leftover mashed potatoes to speed up prep time. Combine potatoes, butter, salt and pepper in a large bowl and mash with a fork or masher. Stir in peas. Refrigerate until well chilled. Put egg whites in a shallow bowl and stir briefly with a fork or small whisk. Put bread crumbs in another shallow bowl. To form treats, scoop up a tablespoon or so of the potato mixture and shape into a nugget or ball. Dip into egg white and then into bread crumbs. To freeze: Arrange nuggets on a plate or pan and set in the freezer for a few hours. Store frozen nuggets in a sealed freezer bag; take them straight out of the bag to bake. To bake in the oven (my preferred method): Preheat oven to 400 degrees. Set nuggets on a parchment-lined baking sheet and spray lightly with olive oil or cooking spray. Bake for 20 minutes or until nuggets are lightly browned and crispy. 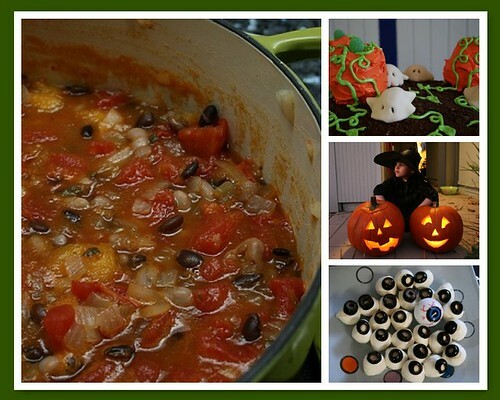 We're getting ready for Halloween with a slew of special treats! Over the next two weeks, we're sharing our favorite pumpkiny recipes, fun tricks to spookify a lunch box, and special dishes perfect for Halloween parties and fun dinners. Some of them are new, and some are favorites from the 250 recipes in our archives. This is one of our favorites from seasons past: Anna's Pumpkin Pudding, an easy homemade treat decorated with an easy and vibrant fresh cranberry sauce. As my kids drool over the bags of candy in stores (are those bags getting bigger every year? 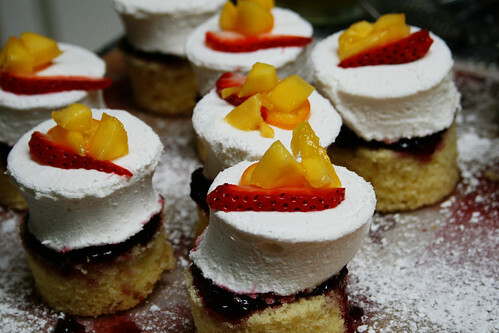 ), I feel swamped by sweets. But this pudding, whose only indulgence is condensed milk, is a great way to satisfy your family's sweet tooth without caving in to this sugar-crazy season. 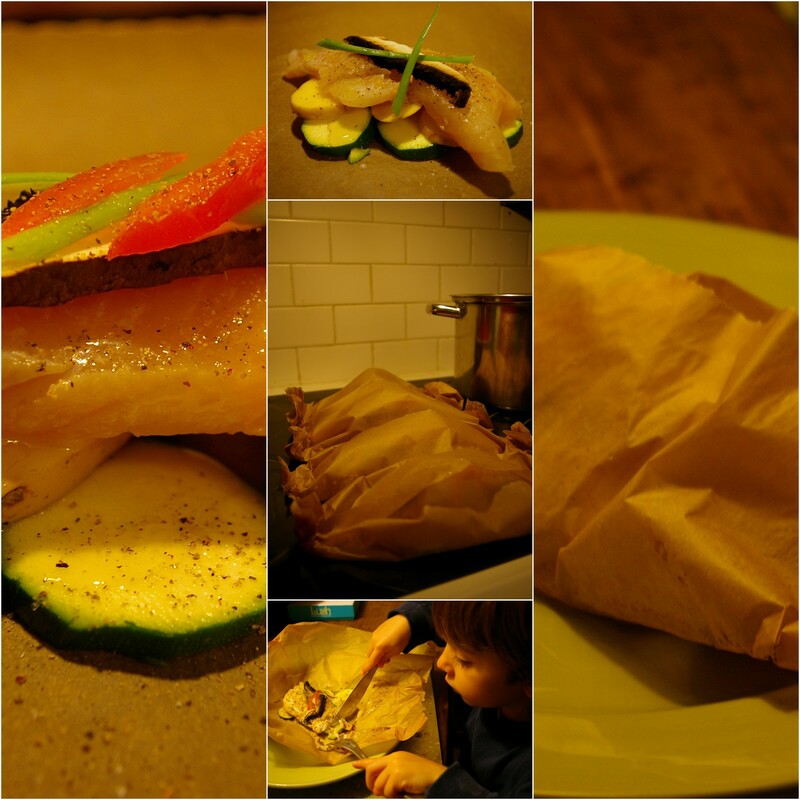 Ideally it should be prepared one day before dinner party. But a good 6 hours in the fridge will do the trick if you are in a hurry. In one bowl mix condensed milk, pumpkin and spice. In a sauce pan, warm almond milk and dissolve the gelatin in it. When gelatin is dissolved and mix is warm, add it to the bowl of pumpkin and condensed milk and blend well. Pour into a plastic mold or bundt cake mold and refrigerate for at least 6 hours. For the sauce, simmer cranberries with apple juice until smooth. Remove the chilled pudding from of the mold and spoon the sauce over it and into the well in the center. I've been flirting with the idea of eating less animals and more plants for a long time. That doesn't mean that I will campaign for strictly vegetarian or vegan, but I would not feel totally okay writing about this if I omit that something changed in my lifestyle after watching Forks over Knives. 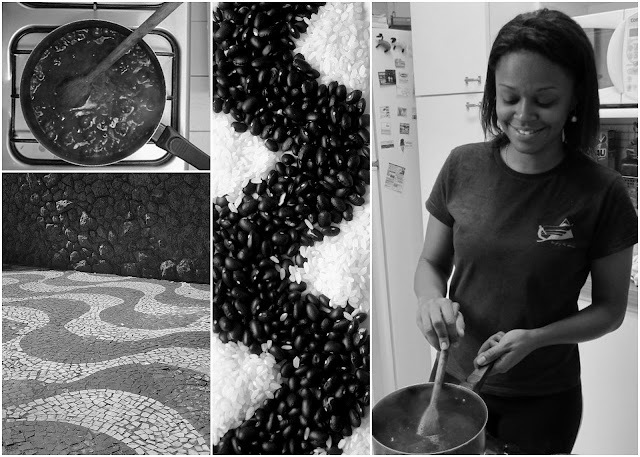 Having said that, I am now happy to tell you about my renewed love for beans. Black beans are a longtime a favorite here. Kidney beans have always been in spicy and beautiful chili con carne dishes. Even fresh string beans are always on my mind when I need to add more greens to any plate. They are all loaded with protein and fiber and lots of iron. But nothing compares to the uniqueness of fresh cranberry beans. I found them when I went to my favorite local farmer's market, Old Mac Donald's. They caught my eye because of their bright color and curious name. Please give it a chance even if you are not so attracted by the idea of beans. These are especially flavorful, have nutty and sweet notes and perfect texture if cooked al dente. They will lose their beautiful spots during the cooking, but will gain lots of flavor. Most kids will try it and at least will have fun opening the shells just to find the beauty of each bean, like pearls in a shell. Their season is at its end, so if you are lucky to find them in your farmer's market, here's a simple and delicious way of enjoying them. Heat oil in a heavy-bottomed pan. Add garlic and bay leaves, lower heat to medium, and brown them lightly. Add beans and sauté with the garlic for a few minutes. Add water. Cover pot and simmer for about 25 minutes or up to when the beans are soft enough, but not mushy. Open pan and add oregano and lemon zest to finish, cooking about 5 minutes more over low heat with the pot uncovered. Serve with a drizzle of olive oil.